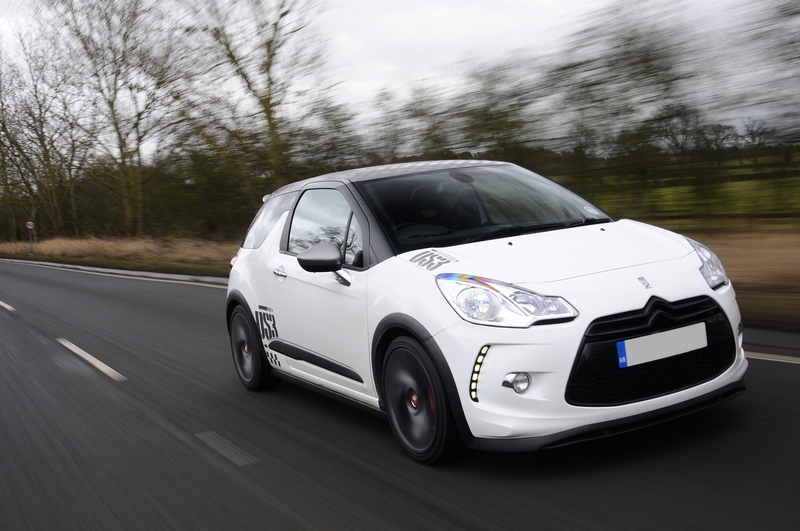 Superchips has a treat in store for owners of the latest version of the 110 bhp Citroen DS3 E-HDi model, in the form of a new performance enhancing ECU remap (or ‘chip’) which adds significant extra performance without harming the car’s fuel economy. The technicians at Superchips have worked their magic on the Citroen DS3 E-HDi’s Bosch EDC17 ECU, unlocking an extra 23 bhp at 4750 rpm, allied to a torque boost of 50Nm at just 2765 rpm, giving you real extra pulling power, just where you need it! And, thanks to the extra efficiencies realised from the optimised nature of the Superchips ECU remap, the DS3’s famed official 74 mpg combined fuel consumption will remain intact if the car is driven in a ‘like for like’ manner. In many cases, fuel economy gains of up to 7% can be experienced. Who says you can’t be good to the planet and enjoy yourself at the same time? Superchips makes the hot Citroën DS3 Racing even racier! Citroën’s special edition 204 bhp DS3 Racing has been causing waves in the hot hatch market, but now the electronic tuning experts at Superchips Ltd can enhance the car’s performance even further! Available now, the Buckingham based concern is delighted to unveil a performance boosting ECU remap for the DS3 Racing, designed to deliver the ultimate driving experience to fans of Citroën’s current flagship model. 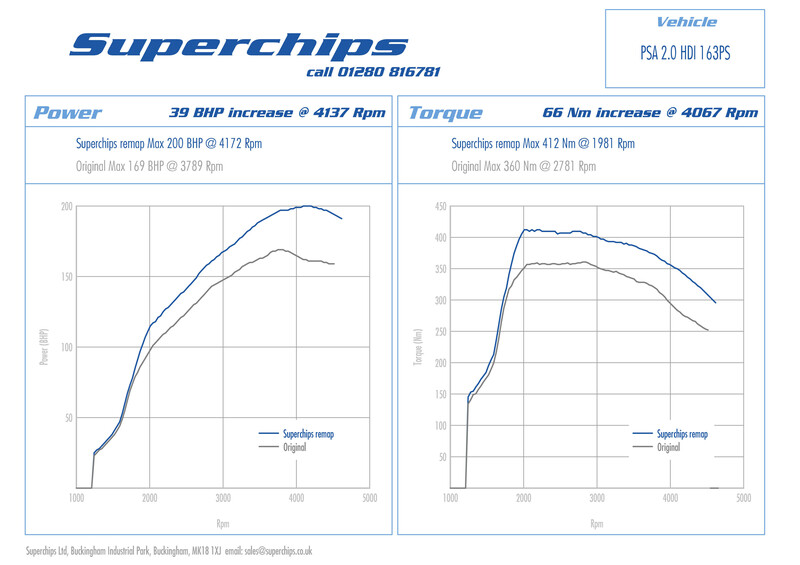 The culmination of forensic analysis by Superchips’ engineers of the DS3 Racing’s Bosch MED 17 ECU in conjunction with in depth dyno and real world road testing, the Superchips remap safely delivers significantly enhanced performance without compromising reliability. 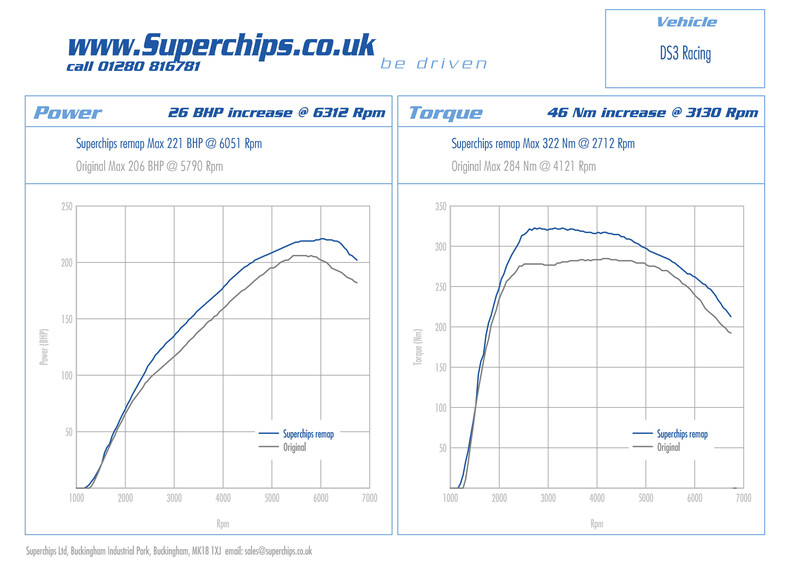 In-house dyno testing of the Citroën DS3 Racing by Superchips reveals that the ECU conversion produces a maximum power gain of 26 bhp at 6312 rpm. 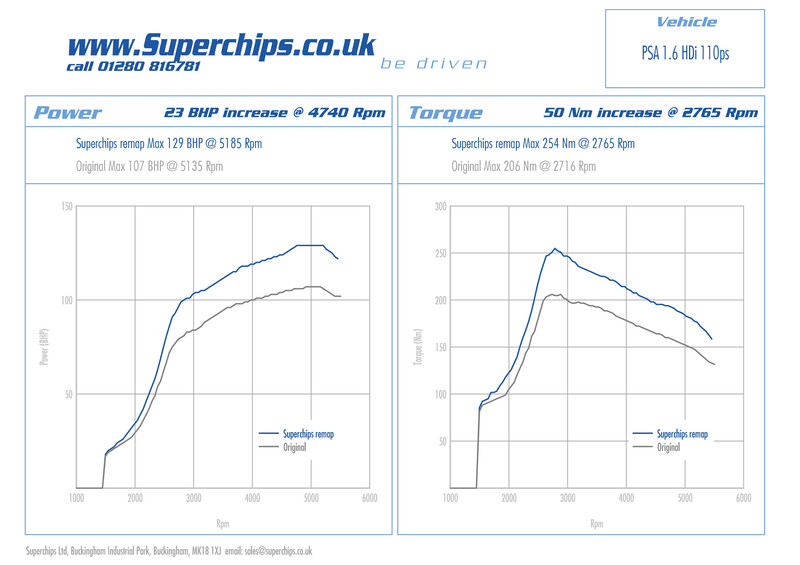 Pleasingly, the Superchips upgrade realises performance increases throughout the rev range from the DS3 Racing’s 1.6-litre, direct injection, twin-scroll turbocharged engine, from 2000 rpm right to the 6750 rpm limiter. Superchips has also placed great emphasis on improving the low speed and mid –range performance of the DS3 Racing’s EP6CDTX engine. Throttle response is noticeably improved, while torque increases from 2000 – 6750 rpm, culminating in an impressive peak gain of 46 Nm at just 3130 rpm. On the road the Superchips performance ECU upgrade adds additional excitement to the already vivid Citroën DS3 Racing driving experience. The car feels more eager, crisper and livelier, with significantly enhanced in gear acceleration. No performance figures have yet been recorded, but it’s expected that the Superchips upgraded Citroën DS3 Racing will eclipse the quoted 6.5 seconds 0-60 mph time and 149 mph top speed. However, the additional performance delivered by the Superchips upgrade doesn’t come at the expense of the Citroën DS3 Racing’s 42 mpg combined fuel economy, so despite of the noticeable performance increase produced by the Superchips ECU remap, if a Superchips equipped Citroën DS3 Racing is driven in a ‘like for like’ manner, fuel consumption will not be negatively affected. 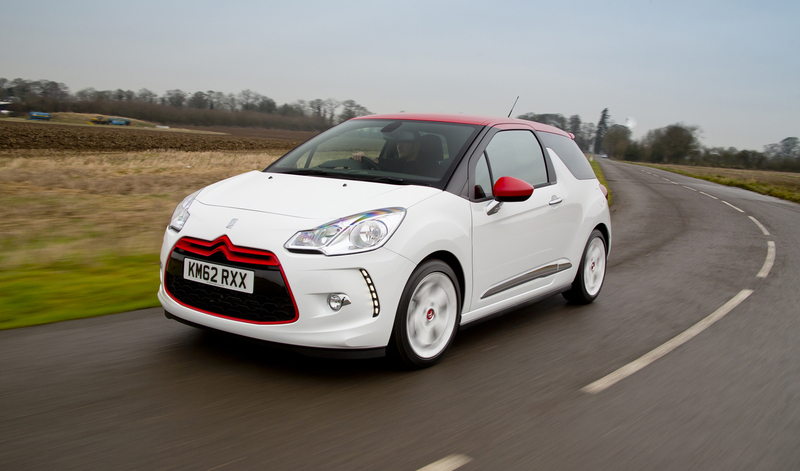 Suitable for all Citroën DS3 Racing models produced from January 2011 onwards, the Superchips ECU remap is available now directly from Superchips and its UK dealer network, priced at £455.00, including VAT @ 20%.